Since July 2000 AVO has detected a slight increase in the number of small earthquakes beneath Makushin. The earthquakes generally ranged in depth between 0 and 8 km and were too small to be felt by humans (M0-1.5). The seismic activity was not considered to be an immediate precursor to eruptive activity. Similar fluctuations in earthquake activity have been observed at a number of Aleutian volcanoes that did not result in an eruption. The Concern Color Code remained at Green. The last eruption of Makushin occurred on 30 January 1995 and produced an ash cloud that rose to ~2.5 km altitude (BGVN 20:01). 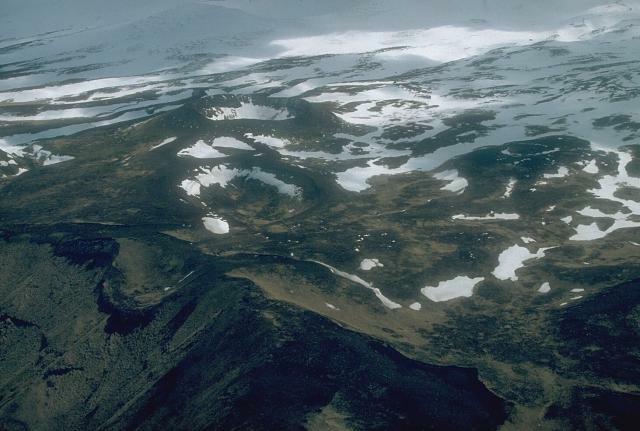 The Alaska Volcano Observatory reported that during July 2000 to June 2001 they detected a slight increase in the number of small earthquakes beneath Makushin. The volcano is located 25 km W of the city of Unalaska/Dutch Harbor in the eastern Aleutian Islands. Hypocenters of the earthquakes generally ranged between 0 and 8 km depth. The events had magnitudes of 0-1.5, so they were too small to be felt by humans. The earthquakes were not thought to be immediate precursors to eruptive activity because similar fluctuations in seismic activity have been observed at a number of Aleutian volcanoes and were not followed by eruptions. The level of concern color code remained at Green. 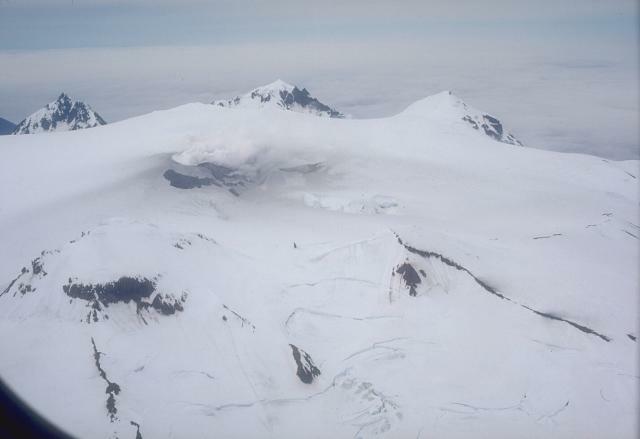 On 20 December, pilot T. Madsen (Aleutian Air) noticed anomalous amounts of steam rising from six large and closely spaced steam vents just E of the summit. The largest plume was 500-600 m high. No ash was observed in the white plumes. Air temperature at 2,400 m was -6.7°C, warm for that altitude. Steaming remained anomalously vigorous for the next two days before returning to a more normal level. Based on John Reeder's observations . . . since 1979, the summit steam activity is continuous and normally reaches heights of 100 m or slightly less. On 28 April at 0700, James Dickson observed a 450 m vertical steam plume over Makushin that trailed SE for at least 30 km. He detected no ash in the plume. 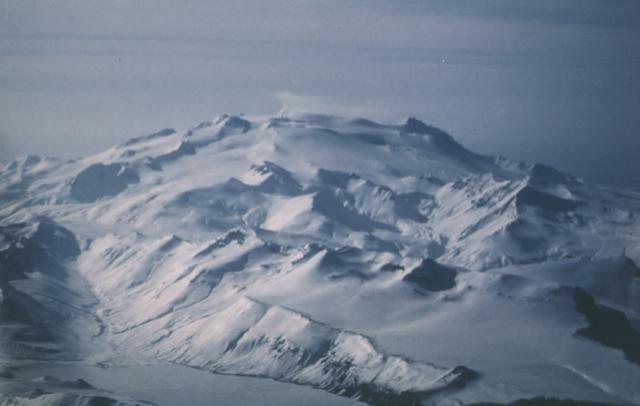 On 2 March between 1700 and 1940, a dark eruption plume rose about 900 m above the volcano and drifted SW [this was actually an eruption from Akutan; see 12:04]. After the eruption a 60-m-high steam plume remained. An airplane pilot (T. Madsen) noted two fairly large steam vents, which he had not noticed on previous flights, on 29 February and 1 and 2 March. The 2 March eruption plume [previously reported] was actually a plume from Akutan. Activity on 2 March was limited to a steam plume containing ash that extended at least 30 km E from the summit. Pilot H. Wilson (Peninsula Airways) observed several steam plumes rising at least 250 m above the summit and drifting at least 3 km WNW. He noted particulate matter, possibly ash, over snow in the summit region. Information Contacts: J. Reeder, ADGGS; T. Miller, USGS Anchorage; W. Gould, NOAA/NESDIS. "Reports of possible eruptive activity . . . 22-23 January reflected a combination of intense lightning near the volcano and a strong sulfur odor detected in Dutch Harbor, 25 km E. The lightning was apparently associated with the passing of a strong storm front, and winds were blowing directly toward Dutch Harbor. A small steam-and-ash cloud observed by Coast Guard C-130 pilots at 1246 on 30 January reportedly rose to ~2,400 m altitude and was carried NE from the volcano. Several pilots reported a diminishing light brown ash plume during the next hour, and all activity apparently subsided shortly thereafter. A satellite image recorded at 1345 showed no sign of eruptive activity, but the NWS issued a SIGMET that ran until 1700. The ice-covered, 1800-m-high Makushin volcano on northern Unalaska Island west of the town of Dutch Harbor is capped by a 2.5-km-wide caldera. The broad, domical structure of Makushin contrasts with the steep-sided profiles of most other Aleutian stratovolcanoes. Much of the volcano was formed during the Pleistocene, but the caldera (which formed about 8000 years ago), Sugarloaf cone on the ENE flank, and a cluster of about a dozen explosion pits and cinder cones at Point Kadin on the WNW flank, are of Holocene age. A broad band of NE-SW-trending satellitic vents cuts across the volcano. The composite Pakushin cone, with multiple summit craters, lies 8 km to the SW of Makushin. Frequent explosive eruptions have occurred during the past 4000 years, sometimes accompanied by pyroclastic flows and surges. Geothermal areas are found in the summit caldera of Makushin and on the SE and eastern flanks of the volcano. They represent the largest and most investigated high-temperature geothermal resources in Alaska. Small-to-moderate explosive eruptions have been recorded at Makushin since 1786. Beget J E, Nye C J, Bean K W, 2000. 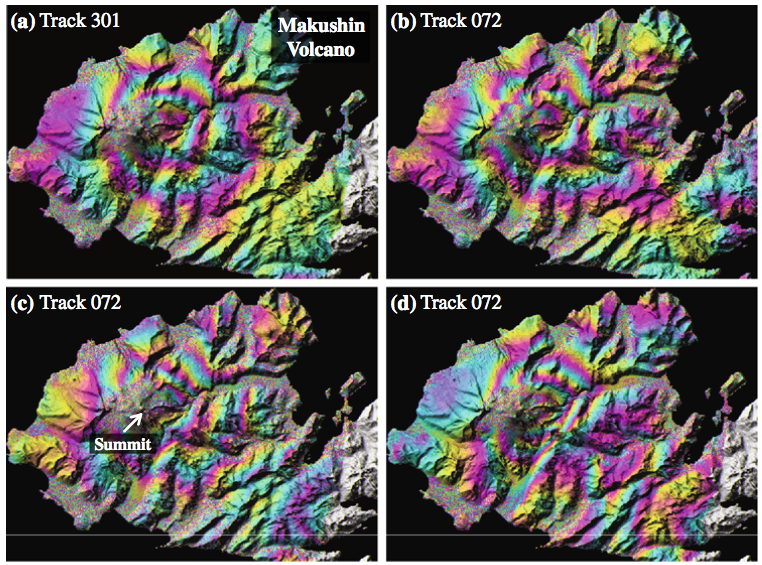 Preliminary volcano-hazard assessment for Makushin volcano, Alaska. 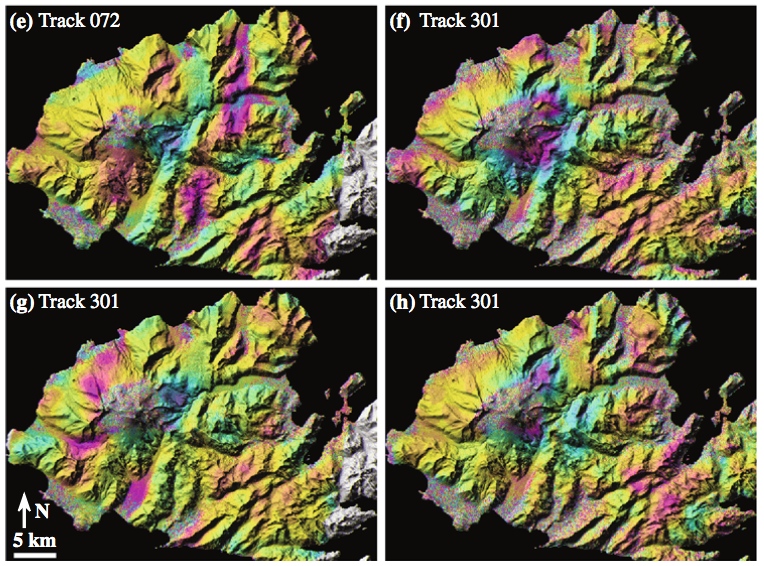 Alaska Div Geol Geophys Surv, Rpt Invest, 2000-4: 1-22. Makushin volcano is a large, ice-covered volcano on northern Unalaska Island. This March 2, 1987, view from the NE shows a small steam column originating from a vent at the left side of the broad summit and drifting about 3 km to the WNW. A 2-km-wide summit caldera helps give the volcano a broad, dome-like structure that contrasts with the steep-sided profiles of most other Aleutian stratovolcanoes. Minor explosive eruptions have occurred during historical time. An aerial view of the summit area of Makushin Volcano, a 2036-m-high stratocone in the northern part of Unalaska Island in the eastern Aleutians, shows steam rising from a crater (left center). The broad summit of Makushin is truncated by a 2.5-km-wide caldera of Holocene age and contains an active cinder cone that has produced minor explosive eruptions in historical time. Photo by Chris Nye, 1982 (Alaska Division of Geological & Geophysical Surveys). The Point Kadin vents low on the NW flank of Makushin volcano are a dozen or so explosion pits and small cinder cones. They were erupted along a WNW-trending fracture zone that extends to the coast. Photo by Chris Nye, 1994 (Alaska Division of Geological & Geophysical Surveys, Alaska Volcano Observatory). There are no samples for Makushin in the Smithsonian's NMNH Department of Mineral Sciences Rock and Ore collection. 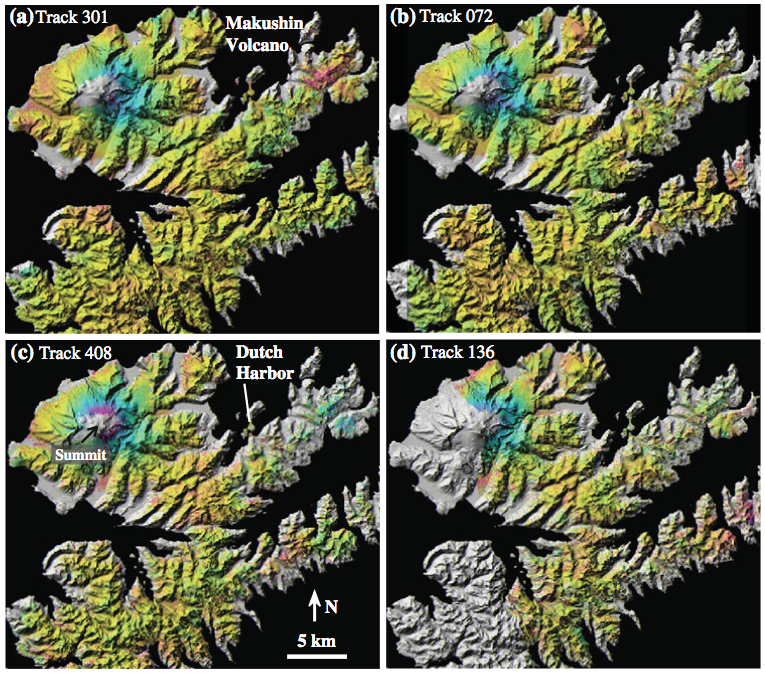 Large Eruptions of Makushin Information about large Quaternary eruptions (VEI >= 4) is cataloged in the Large Magnitude Explosive Volcanic Eruptions (LaMEVE) database of the Volcano Global Risk Identification and Analysis Project (VOGRIPA).